Full HD and Ultra HD video – HDBaseT technology can transmit full uncompressed ultra-HD and 4K video signals, with near zero latency. Power Over Cable (PoC) – HDBaseT will transmit Power Over Cable up to 100W, allowing power from the HDBaseT transmitter to be transmitted via a Cat cable to the receiver unit, thus eliminating the need for a power supply for the receiver. Various Control Signals (IR, RS-232, USB) – HDBaseT delivers control signals from CEC, such as powering on/off and play/stop, to USB/RS232 and IR commands that allow you to operate your source device remotely. Ethernet – Standard 100BaseT Ethernet capabilities include enabling computers, TV’s and other consumer electronic devices to interact with each other. Digital Audio – HDBaseT supports transmission of all digital audio formats including Dolby Digital, Dolby True HD, and DTS master audio. Signal Convergence – HDBaseT provides A/V, Ethernet, USB, controls and power all over a single Cat5e/6/7 cable, this declutters setups, simplifies installations and reduces costs. Performance – This current generation of HDBaseT can deliver up to 4K resolution UHD. USB - The USB extension allows for control of your source PC device remotely with a USB powered keyboard/mouse or interactive touch panel. The high speed USB allows for fast data transfer with near zero latency. 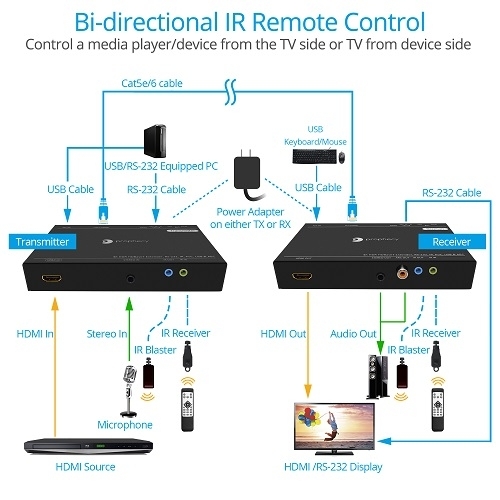 Bi-directional IR Control – Extend the IR signals both ways, either from Transmitter (source) to Receiver (sink) or Receiver to Transmitter. RS-232 – Having RS-232 allows for control of source devices remotely and gives you the ability to change the source and display device, channels, volume, brightness and more. Having RS-232 allows for two-way communication between the source device and the device being controlled. Affordability – HDBaseT gives installers a low-cost infrastructure without losing out on performance. Having HDBaseT removes the need for electrical outlets and cables near the RX due to PoC. Versatility – HDBaseT is easily adapted across multiple sectors and is widely used.